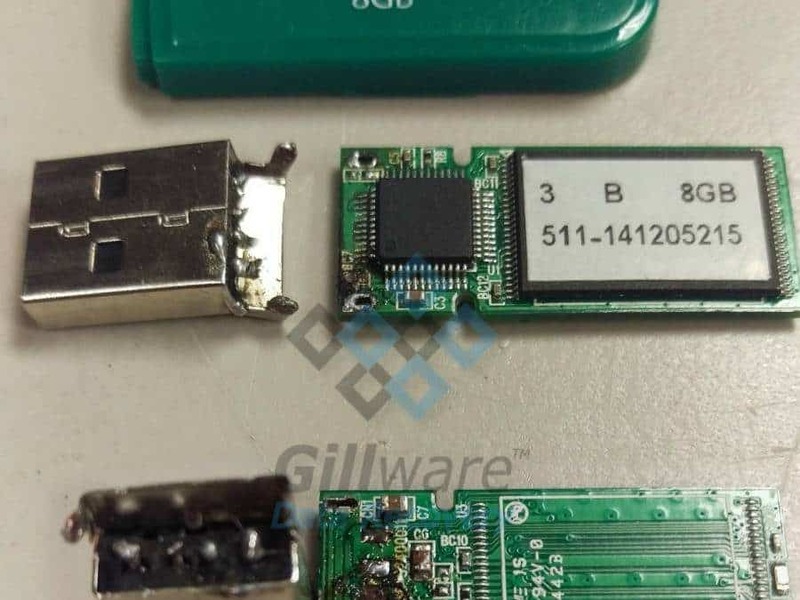 Flash Drive Repair Case Study: Bent USB Thumb Drive | Gillware Inc. The tiny thumb-sized USB flash drives we use to carry data around in our pockets are an odd mix of both fragility and resilience. These “thumb drives” or “jump drives” can survive perilous falls that would put any spinning disk media (such as your portable external hard drive) out of commission. Some can even survive taking a trip through the wash or accidentally accompanying you when you go for a swim. And yet in spite of their portability (and, paradoxically, in part because of their portability) these USB flash drives can easily get bent out of shape. Literally. Do you have a broken USB flash drive and need the data on it? Gillware can help. There are no moving parts in your USB flash drive, which is a massive point in its favor for resilience, as it doesn’t have to worry about things like read/write head crashes and platter scratches. All of the data lives on a NAND chip soldered onto the device’s PCB. The flash memory equivalent to platter damage and rotational scoring would be if the NAND chip became cracked or shattered by a heavy impact or crushing force, which is very rare. 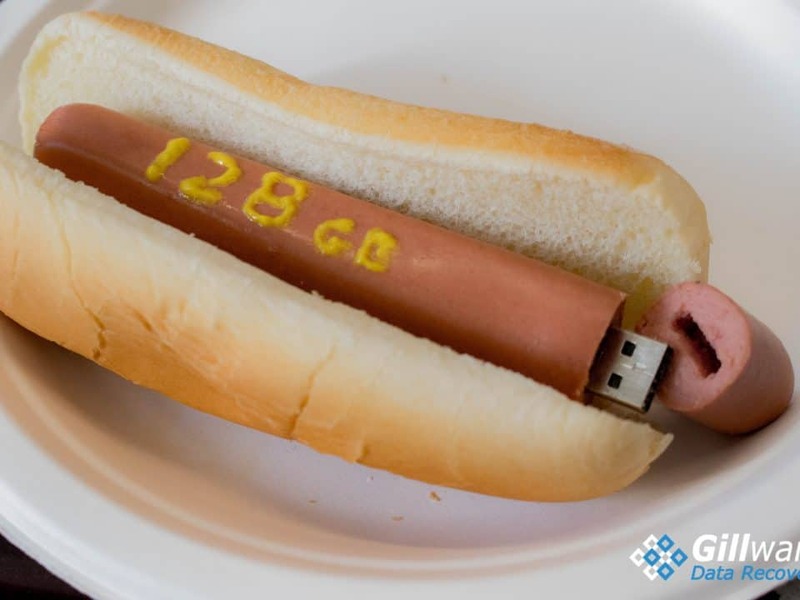 However, your typical USB flash drive or jump drive has one glaring weak point—bigger than the Death Star’s thermal exhaust port. The NAND chip and its controller board are soldered pretty securely to the thumb drive’s control board. It would take an unusual display of force to dislodge them from the board without breaking the chips. But the USB plug that connects the device to your computer is a different story. What’s the Weakest Point in a Flash Drive? Flash drive manufacturers didn’t have many options to reinforce the leads connecting the USB plug to the control board. And so if an errant move of your knee were to jostle your flash drive, with the USB plug securely anchored to your laptop or desktop PC, you could end up putting a lot of force on a very small and very fragile area of your flash drive. Snap! Your thumb drive is toast. Flash device manufacturers were finally able to design a thumb drive that didn’t have this glaring weakness using monolithic flash chips. This device has all of the components of a typical USB flash drive soldered together into a single package, similar to a microSD card. The client in this data recovery case, unfortunately, did not own a monolithic thumb drive. When they accidentally bent their thumb drive while it was plugged in, the USB plug snapped right off. 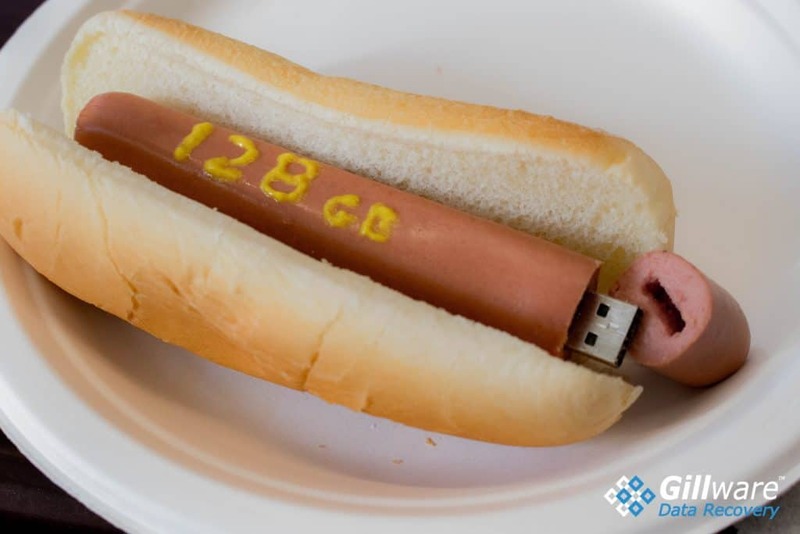 When you can’t access the data on your thumb drive through its USB connection, there is a “Plan B”. However, Plan B just happens to involve removing the NAND chip itself and piecing its data together. It’s hard work, requires specialized tools and knowledge, and isn’t cheap to do, which would in many instances make the cost of data recovery vastly outweigh the value of the data. And so instead of doing that, we work on getting that USB connection back. To recover the data from a bent USB flash drive, our flash drive repair experts focus on fixing the tip of the USB drive. In other words, we need to repair the damaged USB plug connection. 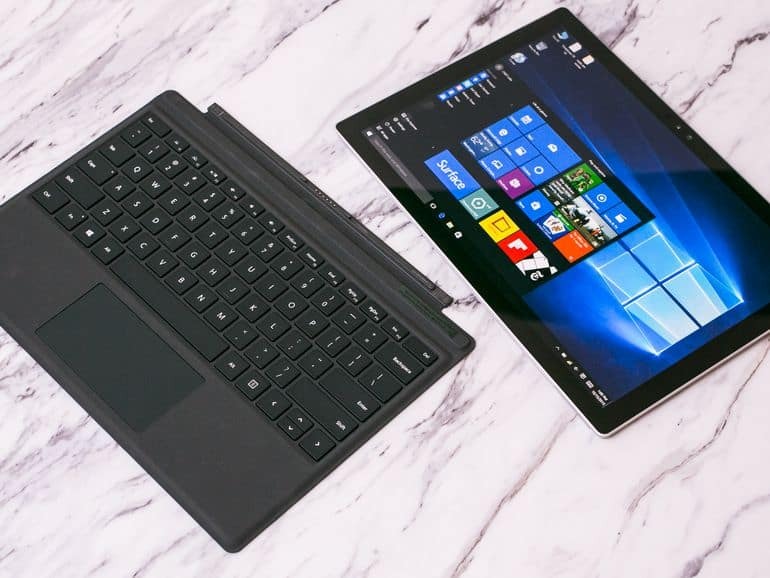 This is difficult and delicate work in itself, and can easily be done wrong by an inexperienced data recovery novice and make data recovery more difficult. But we don’t have data recovery novices tackling these cases—we have data recovery experts. How Hard is it to Repair a Thumb Drive? USB drive repair can be difficult depending on how the device has been broken. In cases where the connectors have been damaged, it takes an experienced electrical engineer to repair a thumb drive. Engineers must carefully resolder the damaged connection between a flash drive and its USB plug. If done wrong, the data on your drive can become even harder to recover. But once the hard work is done, these bent flash drive repair cases tend to be successful. The USB drive hadn’t sustained any logical damage or file corruption due to its sudden and violent ejection. We recovered 100% of the user’s critical Word documents and Excel spreadsheets. This data recovery case was a ten on our ten-point scale. It is precisely because of their fragility that we here at Gillware do not recommend using USB thumb drives to store sensitive data. They’re also easy to lose. And if your flash drive goes missing, Gillware’s data recovery experts can’t help you find it. Thumb drives should only be used to transfer data from one computer to another, and never to store critical data. Why Is Your USB Not Recognized? USB Drive Repair – What Does “Error Code 43” Mean? This client came to us with a bent USB drive for Gillware’s flash drive repair services. Unfortunately, this isn’t exactly an uncommon scenario. In many models of flash or jump drives, the point at which the USB plug meets the rest of the drive is the weakest and most vulnerable part of the drive. While thumb drives can withstand many things, excessive force on that portion of the device can sever the connection between the USB plug and the data living on your flash drive, cutting you off from your data. And unfortunately, due to the weakness of this particular area, “excessive” force isn’t really all that excessive. It can take just a nudge in the right place to render your data inaccessible.